Written by Nicole Kohler on April 21, 2016 Blog, Customer stories, Product news. Our second WooConf took place earlier this April, and what an event it was. We had an incredible lineup of speakers, fantastic lunches and happy hours, and all the networking we could handle. We’ve already shared some of our learnings from WooConf itself, but we wanted to dive a bit deeper and tell about part of the journey we took to get from “we should do that again” to “oh heck, we’re actually doing it!” And that part of the journey is the ticketing experience. When we announced the availability of WooConf tickets, a new extension was already in action behind the scenes — one that we’ve released for you to use, too! When we sold tickets for WooConf 2016, it was with a solution we’d developed ourselves: the new Box Office extension for WooCommerce. With Box Office, attendees don’t have to go offsite to sign up for your event. You can sell tickets, customize email communications, and check in attendees on-site, all from the familiar WooCommerce interface. Using Box Office and running our own major event gave us an incredible learning opportunity. It allowed us to understand the extension inside and out, find out what triggered attendees to buy tickets, and glean knowledge that we could use for future WooConfs. Read on to find out what we learned — and what knowledge we can share with you — about running a successful event website. One of the biggest pieces of feedback we got before developing Box Office was that all of the event and ticketing options available for WordPress or WooCommerce required an integration with another platform. This meant sending potential attendees to a different website to buy their ticket, enter registration information, or fill out their profile. This reliance on third party tools went against the ethos of WordPress and WooCommerce — it wasn’t an ideal experience for our customers, and it certainly wouldn’t be an ideal experience for us. So when our team began planning the second WooConf — and Box Office, in turn — we had one major goal: to avoid sending customers off-site to purchase tickets for an event. Luckily, Box Office was made to do just this, so we were set. With the beta version of the extension in place, we got to work setting up ticketing pages. Initially, customers could only purchase tickets for admission to the event in Austin, Texas; livestream tickets would be sold at a later date. A look behind the scenes at the forms required for WooConf ticket purchases. 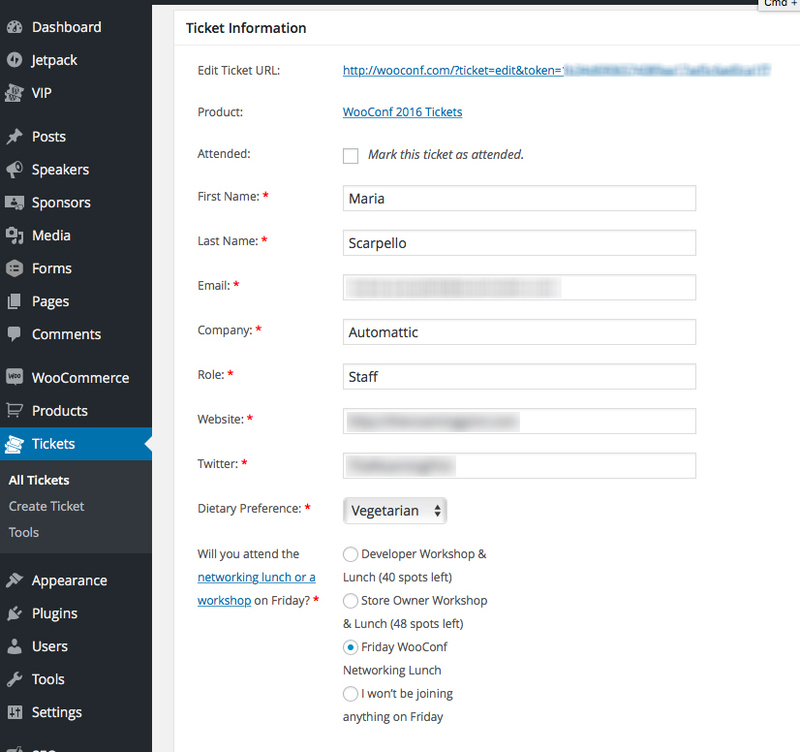 We set up a ticket product for physical attendees, called WooConf 2016 Tickets, and added multiple forms that would display at the time of purchase (which you can see above). Attendees were asked for typical details, like their names and contact information, but we also took this one step further and asked for things like website URLs, Twitter handles, and dietary preferences. This allowed us to customize attendee badges automatically during the printing process, as well as get a better grasp on the kinds of food we needed to offer or make available. Each attendee’s information could be reviewed individually, and modified by a ninja if necessary. This combination of a seamless sale process and quick lookup option led to a smooth handling of tickets both before and during the event. We had very few hiccups in the process, and checking in attendees on-site was quick and easy — much easier than it would have been if we’d been juggling two (ore more!) different systems. “What should I charge to get into my event?” It’s a common question, and a tough one at that. We struggled with it, too! If there’s just one thing we learned, it’s this: offer a more attractive price to the attendees who purchase early. But don’t rule out giving those last-minute attendees an option to save, either! For WooConf 2016, just as we did with our first WooConf, we offered “early bird” pricing — essentially, a discount that was available only to those who purchased in the first few days of ticket sales. From there on, we increased this number by $100 every few weeks, right up until just before the conference, where we had a “last-minute” price. This price also remained in effect for anyone who was interested in buying a ticket on-site. The idea behind this was to encourage attendees to book sooner rather than later. And for the most part, it worked. We made coupons available to sponsors and speakers that they could use to refer their followers and fans to WooConf, effectively giving them a discount off their ticket. Having said that, not everyone can always book right away. So we made some coupons available to soften the blow of these increased prices. We gave our sponsors and speakers some unique codes that they were encouraged to share. They could be distributed on social media, in email, and so on. When these coupons were shared, it drove up interest in WooConf even further, resulting in higher ticket sales. It also helped our speakers and sponsors get the word out about their presence at WooConf, so their fans would know that they could see them there. The lesson here: consider your pricing carefully. Even if your event is low-cost, there are plenty of ways you can encourage more attendees to opt-in, like coupons, discounts, or promotions through other participants. 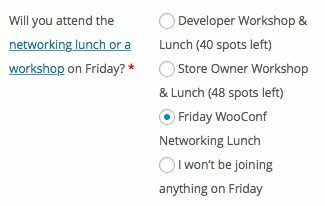 When we were planning WooConf, we knew that the bulk of the event would last for two days, and that the third day’s activities would be optional. We wanted to find a way to easily allow attendees to RSVP for one of the Friday activities, as well as easily change their RSVP if something came up and they weren’t able to make it (for example, if they had to catch an earlier flight). We achieved this by adding an option to our ticket form that required attendees to select if they would be joining our developer workshop, store owner workshop, or networking lunch. They could also pick “I won’t be joining anything” if two days of WooConf were enough for them. We used custom code to track the number of spots available for the workshops, since space was limited. Attendees were asked to indicate where they would be for the third and final day of the conference. We also allowed attendees to change their attendance settings from the ticket confirmation email that was sent right after purchase. Attendees could change their Friday event RSVP at any time via the links sent out in their ticket email, opening up spots for other attendees who were interested in the workshops. This put the power to opt in or out back into the hands of our attendees. It also completely eliminated confusion for everyone, because we knew how many people to expect at each workshop, plus the networking lunch. In fact, thanks to Box Office so dilligently collecting attendee information, we were able to check people in at the workshops just as we did at the first two days of WooConf. That helped us figure out who among the RSVP’d attendees had arrived, and who we were still waiting on. If you have a big following and are holding a live event, FOMO is going to be a very real thing for some of your fans. This goes double for those of you who regularly unveil new products or have some really great speakers. We wanted to accommodate those who couldn’t make it to Texas but still wanted to soak up all that knowledge and WooConf goodness from afar. So, in March, after our regular ticket sales had ended, we made live stream tickets available. A banner ad for live stream tickets, which you might have spotted in an email or two. To do this, we made a new ticket product for live stream tickets. The ticket fields here were much more limited (since we didn’t need to ask for details to print on badges or dietary preferences), which helped speed up the checkout process immensely. 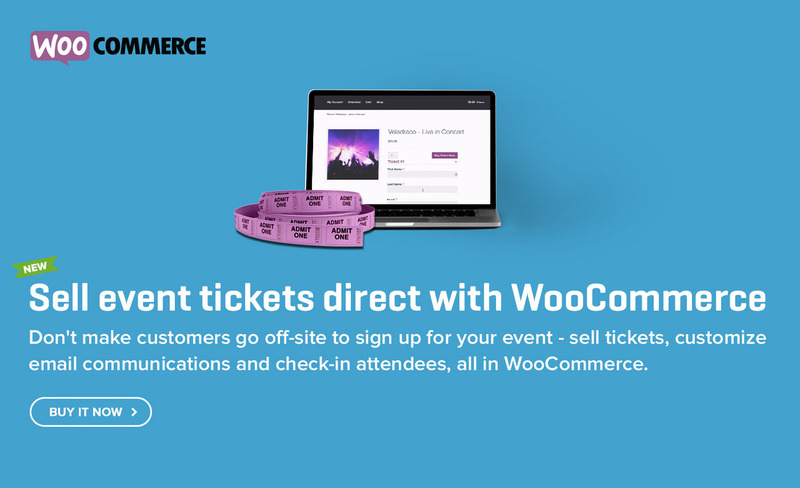 Then, on the day WooConf began, we were able to use the extension’s built-in email option to send these ticket holders a link to the live streaming page. Want to see the stream? Just buy a ticket and you’re in. This allowed everyone who wanted to take part in WooConf to do so, whether they could make it to Austin or not. And the live stream mostly ran without a hitch, which was a huge relief for us! We were really happy with the feedback we got on the live stream. In fact, we sold more live stream tickets after WooConf got underway than we did beforehand. Guess all those #WooConf tweets alerted everyone what they were missing out on, huh? It’s definitely worth setting up live stream tickets for events where not all of your fans can logistically attend, but will be missing out if they don’t catch the action. You can always make the tickets free, too — this is even the expected setting with online-only events like webinars. Whether you’re in the business of selling tickets to events for your nonprofit or are thinking of holding invite-only webinars to spread your knowledge to potential customers, the Box Office extension can make the process of collecting attendee information smooth as silk. We had a blast using it for WooConf 2016, and are beyond excited, after testing it out in a real event application, to finally release it to you. We hope you have just as much fun trying it out as we did! If you have any questions or comments about how we used Box Office for WooConf 2016 or what we learned running the event, give us a shout below — we’d love to hear from you. It looks like this plugin does a great job of consolidating functionality of other plugins for festival seating events. It would be great to see this expanded to cover reserved seating events including seat selection on a seat map with a cart timer along with group (bundle) and max purchases. For us, its just not that compelling because we have more flexibility at a comparable cost using variable products in conjunction with other available plugins. These are great suggestions Bob, thanks! Great plugin. Is it possible to do event subscriptions? For example, a cinema offering a ticket subscription for a club membership. Hey Sebastien, thanks! As of right now there’s no integration with WooCommerce Subscriptions (or Memberships), but if there’s demand for this we could add it in a future update. I agree and think event subscriptions would be a good add on. We have some clients with weekly events and could maybe up-sell subscriptions on their websites. Thanks Kyra! Sounds like integrations with our other extensions should be next on the dev list. These look to be doing the same thing essentially. Would there be any benefit in established users swapping systems to Box Office? Any chance of seeing a comparison chart? I’d also like to know more about the differences between the products. We had purchased Event Tickets Plus for a client’s website, only to find out one of the touted features — selling tickets on custom post types — hasn’t worked since Day 1. 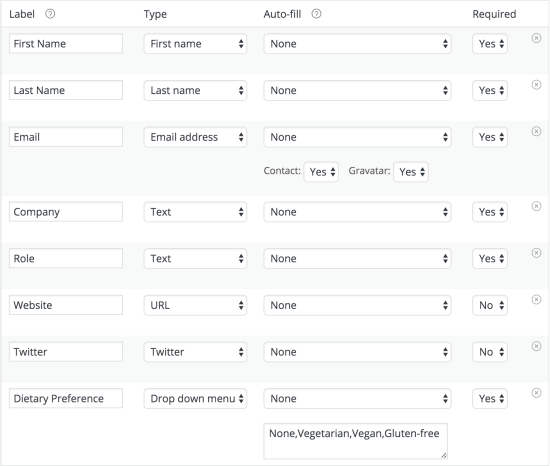 Because of that we’ve set up a convoluted setup with WooCommerce Custom Fields Product Add-Ons (through CodeCanyon) to be able to sell tickets and take custom information. Not at all ideal. Box Office should help you avoid that convoluted setup, but if for any reason it doesn’t work out, we have a no questions asked 30 day money back guarantee on all of our products. Hi Syrehn, I checked with the developer of Box Office and we both took a look at Event Tickets Plus to compare the two. Modern Tribe’s extension looks like it allows you to both manage events and sell tickets. Box Office focuses on the latter alone right now (selling tickets). In our case, the event is symbolized by your WooCommerce product (whether it’s a stand-in for a physical event, access to a webinar…). Both solutions offer attendee management, including check-in with barcodes (though note that with Box Office you do need a second extension to print these barcodes, currently). In Box Office, we offer custom fields that store owner can define to gather information of attendees when purchasing the ticket, as you’ll see in the examples above — dietary preference, which days you’re attending, etc. So it’s a little more customizable, from what we can tell. So all in all, the core functionality is similar. Event Tickets Plus allows event management, but Box Office offers more customizable fields and flexibility. We have a few clients that run festivals that have 40 or 50 events over a period of a few weeks. Would Box Office work for this scenario? Another question… Can you use this for a physical box office? So have a member of staff filling out and making purchases on behalf of an attendee (in person) and then printing out their tickets. The transaction would be paid by cash or card and done in person. It looks great. We need to be able to allow a person to purchase event participation for multiple registrants. For example a practice manager purchases attendance for 5 Dr.s in the practice. Each of the registrants would need their own barcode to demonstrate attendance for CE applications. Any suggestions regarding how to accomplish this?